MacBook or Second Generation iPad Pro to have Two Screens? The US Patent and Trademark Office recently published two new patents filed by the Cupertino company in 2015. Apple may be on to making a device with dual screen. The so-called-device seems to be in the form of a notebook with two screens that is attached by a hinge that allows one of the screens to be used as a keyboard, gaming console or sketch pad. In another scenario the hinge used to secure the two screens together could be detachable and the likely device could be used as a second generation iPad Pro. The device is said to have in one case a permanent hinge while in next case it could also have a detachable magnetic kind of hinge that will lead to apple making a dual device with two screens. This dual screen tech that Apple has going will be also usable with the user wearing a pair of sunglasses too. With this multiple use screen that may double as a keyboard or gaming console, apple has used tech that prevents the screens from reflecting off one and another. Apple has used polarized layers and some other optical layers in making their iconic dual display. This tech is to allow the wearer of vertically polarized sunglasses to view material on the dual display with a minimum of reflection. Another possible use of this tech is to minimize reflections from the first screen onto the second screen. 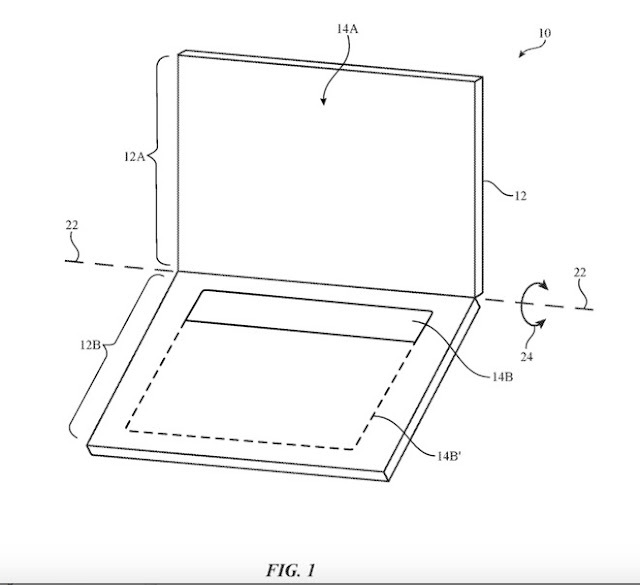 Apple may not have been the first company to go in for dual screen devices as Lenovo has already entered the market with its sleek dual screen notebook. According to reports, the first display could be a liquid crystal display that has an inner and outer liner polarizer. The second display may come in an organic light- emitting diode display. The second display having organic light emitting diodes could have pixels that contain thin film- like transistors and these organic diodes that emit light. The second display may also come with a circular polarizer which is used to cover the pixels to suppress ambient light reflections. The patent termed as “dual screen with enhanced visibility and suppressed reflections” may come in a device that has the first screen and then directly below it the second screen as a horizontal strip while the rest of the base may be a keyboard or trackpad. In another likely scenario both the screens may take the form of a device which has one screen used as the monitor and the other that functions as a keyboard or a large trackpad.